It is your last year of high school and you started thinking about which career path to take in life. Graphic design happened to be one on the list but you are still hesitant because you don’t know much about what to expect from it since you’ve never taken anything similar in school. 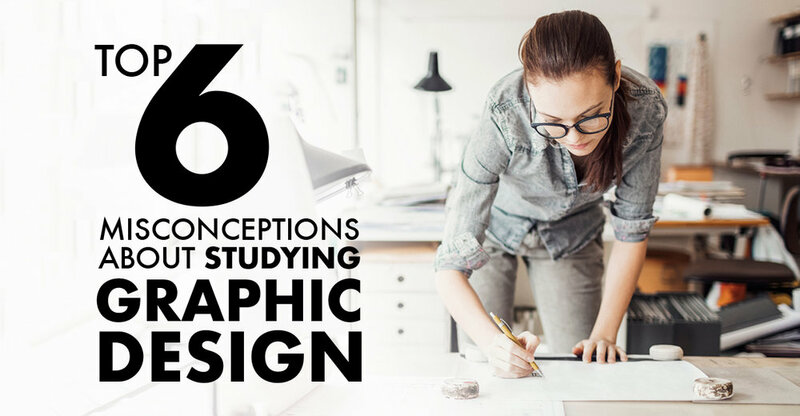 So here are 6 common misconceptions that you might have about the requirements of pursuing graphic design for your career to help you make a more informed decision. While knowing how to draw is certainly an added feature, it is not a necessity. If you know how to pick up a pencil and draw a house with a garden and a dog outside that can be recognized by another human being, it is enough to say you passed the test of sketching. In graphic design, drawing by hand is a necessary tool to mostly communicate an idea (be it a shape, a layout or an icon) to your client, manager or colleague. Anything more than that is just an added value. Layout and cover design of magazines, newspapers, and books. Layout and page design of websites and mobile Apps. Logo design, business cards, stationary design, packaging. Billboard and online advertisements (Google ads and Social media posts). And if you dive into motion graphics, you get to also design and animate TV & movie openers, headlines, credits and more. Graphic design is NOT an art. A graphic designer may be an artist in his/her free time but he/she is not one at work. Graphic design is the act of solving visual communication problems: It is about making a bulk of information reach its target smoothly and beautifully. You don’t need to recreate the wheel but you do need to make a website/package/flyer/etc. enticing enough to grab and read. Just like all majors out there, studying graphic design has its expenses. The only difference is that in most majors, you buy a few books, copybooks and a couple of pens at the beginning of each semester, and that would be it until the course ends. In graphic design, you may not have as many books to buy every semester (Yey! ), but you will have a lot of drawing, painting and designing tools to buy in the first year. Plus, a lot of trips to the printing house paying for your A4, A3 and plotter-sized projects on a weekly/bi-weekly basis. WRONG. Graphic design might be easier than finding a cure to cancer, but it is not easy in the broad term. Unlike Math where you have one solution to a problem and one way to find it; to solve a visual problem in graphic design, you need to go through a lot of options to finally find the one that works best for your product or client. This process takes a lot of thought, a lot of trials and errors, and is something that you develop through your years of practice. The client might not love your solution, they might even hate it, so you will also need to be able to accept critiques on your work and be ready to find another solution that would be more suitable. I hope this list helped you understand a bit more about studying graphic design and gave you that extra push if you were considering it for your career. If there is anything you’re unsure of or any questions you have in mind, feel free to drop them in the comment section and I will do my best to answer them.